Do you ever have days when you feel like you are a bad parent, or at the very least question your ability to bring this child God has given you to adulthood? I know that I do. There is so much pressure on parents today. To some extent, I guess that there always has been, but I think that today there are so many choices involved in how you raise your children. From what you feed them to where (or if) they go to school to what activities they get involved in to how much TV to allow them to watch to what behaviors to allow at what age, each day seems to require way too many decisions. It doesn't help that there are so many parenting books, magazines, and websites providing contradictory information. Add in the opinions of your doctor, your mother, and your friends, and I think that it is only natural that we suffer from a little self-doubt once in a while. I am blessed to be friends with many wonderful mothers who I look up to for advice. In many ways, this particular group of moms has raised mothering to an art form. Their children are well-behaved and accomplished in many areas. No one would ever question their ability to parent and yet I know that these mothers have their own self-doubts. No one is immune. to fill a pair of loving arms. how safe this child would be with you." When I have days when I question my ability to be a good mom, I try to remember that God gave me these children. He must have thought that I could do the job. With His help, I am doing the best that I can. That is all I can offer. I am not a perfect mom. No one is. My children will no doubt have much to discuss with their therapists later in life! But I am in this for the long haul, and the most I can do is get up every morning and be the best mom I can be on that day, whatever the day may bring. Even though my children are still very young, I bring up the topic of vocations with them on a regular basis. One day I was discussing the priesthood with them. I was telling them how priests give up marriage in order to dedicate themselves solely to serving God and others. Six-year-old David popped his head up. “What person?” I asked quizzically. David is very concerned about finding the right person to marry. As for the priests, I told him I didn’t think that they had a person. A seminary student was speaking to the children this morning at mass about his own calling. He asked them how many of them had ever thought about becoming a priest or a religious sister. No one raised his or her hand. He told them he understood that it wasn’t a very popular option. He said when he was young he never raised his hand, either. He encouraged them to think about it, though, and talk to people about the possibility of religious life. With my own children, I encourage them to pray to God to make the right decisions for their lives. I don’t know what God wants from them. I tell them to try to listen for what God is telling them to do. At the moment, David tells me that God is telling him to be a toy maker. Maybe He is. Four-year-old Isaac claims that he is never getting married and is going to live one street away from me so that he can still come home for breakfast. We have lots of time for them to figure it all out. Trying to figure out what God wants of us is not always an easy thing. As a child, I wanted very much to be a cloistered nun. There is a Dominican monastery nearby which my mother took me to often. I always felt at home there. It was, and is, so beautiful and peaceful. I could imagine nothing better than spending my life there and serving God. Then, puberty hit and I discovered boys. Any thought of a religious vocation was put on the back burner. As I got older, I would take out the idea and dust it off a few times, but there was always a man in the picture and marriage seemed like it was my future. I prayed every day for years and years to marry whom I should when I should. Even that decision wasn’t easy. I was engaged twice before I met and married my husband. I truly believe it was only due to my prayers that I ended up where I belonged. God helped me marry the right person for me. Yet, my desire to serve God never left me. It just took a different route than the life as a nun that I imagined as a child. I would go on to get a master’s degree in theology. I got the degree for personal reasons, simply to learn more about God. I never thought that I would put it to use. Then, after the birth of my children, I felt called to start writing in order to help others, especially women, make their relationship with God their first priority. I have been doing that ever since. I feel that in my marriage and in motherhood and in my work, I am where God wants me to be for right now. In the future? Who knows? I will keep praying for myself and for my children that we will follow where God leads. Jill Hart over at Christian Work at Home Mom offered this wonderful suggestion for days when the kids are driving you crazy - start thinking of all the things that you love about them. In fact, this idea has many applications - you can do it when you are annoyed with your spouse, or your mother, or any other significant person in your life. 1) I love the way that they smell - each of them has their own unique scent that I just love to breathe in when they are close to me. 2) I love their hugs and kisses. 3) I love the way Isaac wrinkles his nose when he is thinking. 4) I love how David in his glasses and school uniform looks like a miniature college professor. 5) I love how when I look at them I can remember the babies that they once were and envision the men that they are growing up to be. 6) I love when they say their prayers. 7) I love David's sense of self. 8) I love Isaac's attempts to comfort his brother when he is sad. 9) I love David's thoughtfulness - he truly analyzes things and feels things deeply. 10) I love Isaac's simple joy. 11) I love when they play together in their world of make-believe. 12) I love watching them learn new things. 13) I love curling up and reading stories with them. 14) I love the way David tells me about his day at school as we are driving home. 15) I love how much they teach me and help me grow every day. Today I have been reading "Speaking of Faith" by Krista Tippett. This is one of those books I picked up at the library and wasn't quite sure if I was going to like it or not. I am currently on page 164 and have been pleasantly surprised. One thing that struck me was that Tippett spoke of how author Karen Armstrong likes to refer to herself as an "Amateur Theologian." The Latin translation of that would be one who loves to study about God. Isn't that what we all should be? My sister is ten years older than I am. She studied the Baltimore Catechism in school. I did not. But I had access to the book as a child from her desk and I would read through it. The book was set up in a question and answer format. The first question was "Why did God make me?" The answer was "God made me to know him and to love him." We are called to know and to love God. The only way we can do that is through prayer and study. Then we can carry God's love out into the world through our interactions with other people. Spring has finally come to Western Massachusetts. Most of April had been cold and rainy, but it has been so beautiful the past few days - warm and sunny. The boys have been out playing and wearing themselves out. This is a beautiful thing because it means that they fall asleep quickly at night! My daffodils are blooming and the tulips which I had all but given up hope on because they were three inches tall and showed no signs of buds are actually making some progress as well! Thank you, God, for these beautiful spring days! One of the axioms of parenting is to always be consistent. If you are going to make a rule, stick by it. If you give a warning for a behavior, state the consequences and then be sure to follow through if the behavior is performed again. Like most things about parenting, this is another one easier said than done. I do try, though. I would say at least 98% of the time I stick by my decisions. And yet, my children still test and test and test, on the off chance that maybe just this one time, mom might give in. Children need discipline in their lives. They need to know that there are rules and consequences for breaking them. They need to know that their parents care enough to set limits for them and to help control them especially when they have lost the ability to control themselves. A common punishment in our house is some time spent in the time-out chair. On a good day, no one has to sit in the special chair that resides in the hallway. On a bad day, it is like musical chairs with David and Isaac taking turns throughout the day. On a really bad day, a second time-out chair needs to be established so that they can both be on time-out at the same time in different locations. Another popular discipline technique we employ is one where the item being abused is taken away. For example, if the boys are fighting over a toy, the toy goes on time-out. If a toy is being used to clock one's brother over the head, the offending child not only goes on time-out but loses the right to play with that toy for the rest of the day. Sometimes, though, even when the punishment is clear, it isn't easy to follow through on. Tonight six-year-old David was in his top bunk getting ready to go to sleep and he decided to throw his teddy bear out of bed. I went and got it and handed it back to him. He threw it out again. I picked it up again and told him if it happened again the bear was mine for the night. A few minutes later, he threw it out again. Now, I should have immediately taken the bear away, but I didn't. I knew that this was his favorite , can't sleep without it, teddy bear, and I was trying to avoid a prolonged bedtime battle. So, I gave him one last chance. Thunk. The bear was once again on the floor. This time, I had no choice. I had to take the bear. I tucked it into my bed and told David the bear was sleeping with me tonight and that I would take good care of it. Of course, he grumbled and complained and even cried a bit. He no doubt took longer to go to sleep than he otherwise would have, but I know I did the right thing. I realize this is such a trifling matter. The infractions and punishments are only going to get more difficult with time. My children will continue to test the limits I set for them until the day they move out. That is their job. They are trying to become their own people, to see just where the limits are, what they can get away with, and whether mom and dad actually mean what they say. My job is to stand firm and help provide the structure that they need to grow up to be good people, while at the same time letting them know I will always love them. Even as adults, we like to test our limits. We have God's commandments, but we like to see how far we can push them. We can pretty much rationalize any behavior. When I was growing up, my mother used to tell me that God could always see me and that He could punish me worse than she ever could. Some people discount the idea of a punishing God, but I think that God does let us hang ourselves with our own rope sometimes. We make bad decisions and then have to face the consequences. God disciplines us because He loves us and He wants us to realize the error of our ways. He wants us to understand that we are on the wrong path and help us to make the correct decisions to get back onto the right one. Life is so much easier for my children on the days when they choose to follow my rules. Life is easier for us as well when we choose to follow God's rules. I was making my way through my pile of "stuff to read that I just haven't gotten around to" and came across this statistic in the October 2006 issue of Redbook. A new survey from Duke University said that 25% of people polled said that they had no one to confide in. I find that so sad. I can't even imagine what I would do without my friends, my old faithful friends who have known me forever and love me anyway, and my fellow mom friends who are always there to help me through whatever parenting crisis I am currently experiencing. We need to make time for our friends and make the effort to keep in touch with those important people in our lives. We also need to be open to welcoming new people into our life. Be welcoming to those who are new in your neighborhood or Church. They might need a friend, and you just might find a new friend as well. Life is too hard to go through alone. We have perhaps seen so many Christmas cards during our lives that we are immune to the absolute weirdness of the nativity stories – an angel wanders into a hut in Nazareth and tells a very young woman (fifteen perhaps) that she is about to conceive a child of the Holy Spirit. The young woman, who is probably illiterate, asks how this is to be and then recites a complex poem steeped in the language of the Jewish Scriptures and makes the astonishing prediction that all nations will call her blessed. What’s going on here? Then she and her husband (who is not the child’s father) go off on a difficult journey in the middle of winter . . . and the newborn babe is laid in a pile of straw in a cave somewhere. Then a crew of angels appears in the sky and praises the new babe, whom the shepherds dash over to inspect – shepherds, the absolute bottom of the Jewish social structure, dirty, smelly, rough, ignorant, and religiously unclean men. And what’s this about magicians? Jews were not supposed to believe in magic and certainly not in gentile magic. What’s this all about? Is this a decent way for the expected of nations, the anointed one, the messiah to come into the world? Greeley states that this unusual beginning of Jesus’ story is just a preview of the surprising life that is to follow. Greeley does not approach scripture from a literal viewpoint. He understands that the oral and written tradition that served as a foundation for the Gospels we read today developed over time, but he does allow much room for mystery and faith and maintains that each of the stories has a theological truth to share with us. Each story reveals something about God. Jesus’ relationship with women was revolutionary for its time, and given the current state of male-female relations, perhaps even today. “Someone has remarked that the attitudes and behavior of Jesus with women in his time and place are enough by themselves to suggest that he might be the Son of God.” According to Luke 8:1-3 women traveled with the twelve apostles and Jesus. This was, quite simply, not done. “Women may have ministered to the great rabbis of the Second Temple era, but they did not travel through the country with them. What terrible scandals might come of such an arrangement? . . . To make matters worse – and this would shock the Romans perhaps even more that the Jews – St. Luke practically equates the women travelers with the apostles.” Greeley maintains that this was such a radical concept that the other evangelists don’t even make mentions of these women until they are at the foot of the cross bearing faithful witness after most of the men have run away. Jesus treated his women followers with “great respect and reverence as well as sensitive and gentle tenderness. He did not demean them or talk down to them of keep them in their place – whatever that place might be.” Greeley then illustrates that point by delving more deeply into Jesus’ relationships with several women in the gospels: his mother, Mary and Martha of Bethany, Mary of Magdala, the Samaritan woman at the well, the Gentile woman who asked for her daughter to be healed, the sinful woman who anointed his feet, the hemorrhaging woman, and the widow of Naim. 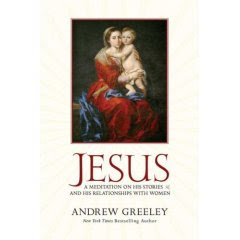 Greeley maintains that these stories taken together provide a seamless picture of how Jesus treated women. “Nowhere in the New Testament does Jesus denounce women, nowhere does he condemn them. . . .Jesus is the model for all male followers of Jesus. One has to say that for much of the history of his followers that model has not been followed, not even seriously considered as a model.” Greeley calls for us as Church to reexamine Jesus’ attitudes towards women for the surprise that they are and reclaim them as our goal for today. Of course the greatest surprise of all is the Resurrection and the promise that it holds for each of us. In “Jesus: A Meditation of His Stories and His Relationships with Women,” Greeley invites is to reflect on this Jesus who surprises is at every turn. He invites us to reconsider the old familiar stories with fresh eyes and insight. While there are moments of digression when Greeley attacks those who have portrayed Jesus differently (Martin Scorcese, Dan Brown, etc), on the whole this is a very readable, interesting book which add to the reader’s understanding of Jesus. I had to take Isaac to the doctor's today for an ear infection. The pediatrician who took care of us was nine month's pregnant with her first child. She is due this week. It made me think of a few other women I know who are expecting children soon. There is the eighteen year old daughter of a friend of mine from Church. She is a single mother, but her parents are welcoming their new grandchild with open arms. There is another mother at Church who is expecting her fourth child, and a friend of mine from playgroup who is expecting her third. All these children are signs of hope. No matter the circumstances of their birth, every child is a gift from God, and a sign that God is still working in our world. These children each come with a mission and each will leave their imprint on our world. We all crave solitude at times, some breathing room to just be and escape from the world for a little while. Sometimes we need solitude to work productively, a time without the phone ringing or co-workers interrupting. Sometimes we need solitude to pray, to center ourselves and listen for God. In the six years that I have been a parent, my children have given me many gifts, not the least of which is an increased appreciation for solitude. Full-time mothers of small children are rarely alone. You have to take your moments when you can. My spiritual director often asks me when I take time for myself. She is a mother herself so I know that she understands when I tell her that I take it when I am able, in short intervals here and there. I also tell her that I have discovered solitude can be as much a state of mind as a physical reality. I do greatly value time alone, but sometimes that just isn't possible. At those times, I can quiet my heart and mind amidst the chaos that surrounds me. I can offer a silent prayer and reconnect with God. I can rediscover the peace that lies within. The God who knows us and loves us better than we know and love ourselves is waiting for us to meet Him in the quiet of our hearts. Embrace the solitude that lies within. Even when your physical circumstances don't allow you to get away and escape the noise and the demands of life, you can carve out moments to revel in the peace and tranquility that come from God. Here are a few more books I would like to get my hands on. To learn more about these books, click on the title text links. The secret that makes sense of the pain and trouble in your life - no matter how great. One thing that you must cherish in your soul, or you'll never learn to love God in the glorious way of St. Therese. 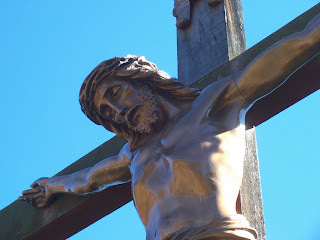 Crosses: why you can't avoid them - and why you should love the ones God sends you. How to deal with failures, reversals, and difficult moments of all kinds without losing your spiritual equilibrium. A Mother's Rule of Life: How to Bring Order to Your Home and Peace to Your Soul looks like a book I could definitely use! In it Holly Pierlot explains the method she has used to: Get her house in order (and keep it that way! ), find more time to be with her husband, make time to pray often during her day, homeschool her five kids, and even write this book in the midst of it all! If your life seems to make no sense, or if you don't know which path to take, St. Francis de Sales will console and inform you. In Finding God's Will for You he explains to you what God's will is and how He reveals it - yes even to you, and even in the seemingly rendom events of your life. Why Does God Permit Evil Hatred, murder, terrorism, and war spring from the sins of men. But why does God let innocent children suffer from the effects of these evils? Why does He let earthquakes devastate cities, despair drive souls to suicide, and cancer kill humans and animals? You and I would prevent these evils if we could. Why doesn't God? In these pages, Benedictine author Dom Bruno Webb brings you face-to-face with evil. Without fudging or flinching, he answers these hard questions and more. In this slim volume, he gives the most convincing explanation of the mystery of evil that's available today. Unfortunately, life has intervened with my plan to put more book recommendations up today. I will try to get to it tomorrow! Thank you for understanding! 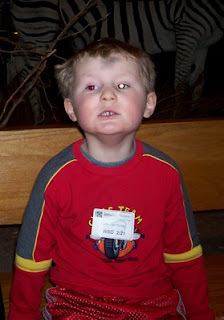 Sometimes "white eye" is just "white eye"
I took this picture of Isaac back on Ash Wednesday when we had visited a local museum. I just uploaded it on the computer and got it from the photo lab last week, however. I noticed the "white eye" in Isaac's eye and vaguely remembered reading something a long time ago that said if you ever saw it in a picture of your child to have their eyes checked. When I was scrapbooking Saturday night, I saw the picture again and asked my husband if he had ever heard anything about "white eye" in pictures. He said, "No" but that we could look it up. Sure enough, the internet told us that this could be a sign of retinoblastoma, a dangerous childhood cancer occuring in 1 out of 20,000 children. There was nothing that said this could just be a "camera fluke." Still, I tried to hold out hope, all the time worrying about my little boy. I called the eye doctor first thing Monday morning and got an appointment for today to have his eyes dilated and looked at. Thankfully, everything was fine. It was indeed just a "camera fluke." The doctor mentioned that there had been another mother in last week with the same concern about a much younger child which makes me wonder if perhaps newer digital cameras are more prone to this anomaly than the old film versions. So, if you come across "white eye" in your photos (especially if it occurs in more than one photo), definitely have your child checked. Retinoblastoma is too serious to ignore, but have hope that maybe everything is in fact OK. I got in the new catalog from Sophia Institute Press today. It was brimming with books I would love to read. So, while I have not read any of these books, I am providing you with a list of the ones that especially piqued my interest. If you are interested in purchasing any of these books, please click on the title text link. The link will bring to the Amazon.com page for that book. Remember, every purchase helps support this site! Thank you! Am I Living a Spiritual Life : Questions & Answers for Those Who Pray. If it's time for you to take the next step on the path of spiritual progress, these pages are for you. They'll provide you with the solid direction you need to develop a rich spiritual life, deepen it through regular prayer, and model it humbly in your relationships with others. Here you'll also discover: How to hear and follow God's special call for you; How to combat loneliness, listlessness, fatigue, and fear; How to pray even when you are tired and discouraged; How to tell if you need a spiritual director (and how to find a good one); Plus much more to help you live a proper spiritual life. A Biblical Defense of Catholicism shows that, far from straying from the Bible, Catholicism is thoroughly biblical. To demonstrate this, Catholic author Dave Armstrong (a former Protestant campus missionary) focuses on those issues about which Catholics and Protestants disagree the most. Working patiently, systematically, and above all, charitably (and citing Church councils, the Catechism of the Catholic Church, Church Fathers, and canon law) Armstron begins his comprehensive examination of each of these disputed issues with an authoritative explanation of what the Catholic Church actually teaches. Then, with skill and tenacity, he subjects each Catholic teaching to microscopic scrutiny, measuring its conformity with the Bible. Catholic Homeschool Companion offers straight talk about homeschooling, along with thousands of helpful, classroom-tested, homeschooling secrets. Here is you one-stop resource for information, insight, and inspiration about every aspect of educating your children at home - written by those who understand it best: homeschooling parents! You'll find wise advice and practical tips to make you a better teacher and your homeschool more productive and enjoyable. Of course, homeschooling involves more than academics. That's why the Catholic Homeschool Companion includes essays to help you foster your children's moral and spiritual development, involve time-challenged dads, teach kids with special needs or in special circumstances, and handle other common problems homeschoolers face. Check back tomorrow for more book recommendations! However, the April 8, 2007 issue of “Parade” Magazine raised an issue that is definitely worth responding to. In the article, “Can Moms Afford Not to Work?” Lyric Wallwork Winik refers to a new book “The Feminine Mistake” by Leslie Bennetts which maintains that becoming a stay-at-home mom is “an economic choice with potentially dire consequences”, arguing that “even taking three years off will cause a 37% cut in earnings compared to women who remain.” She asks, “Are you a better mother if you stayed at home but suddenly can’t provide for your family?” in the event of a divorce. I recently read “The 7 Myths of Working Mothers” by Suzanne Venker. I didn’t enjoy the book, primarily because it just adds fuel to the whole “mommy war” scenario I referred to above. However, Venker makes some interesting points. The reality is that you either raise your children yourselves, or you pay someone to do it for you. The children may turn out fine either way and there still may be a very strong mother-child bond. However, isn’t it ironic that people value child care if you are caring for someone else’s children? No one would tell a day care worker or nanny that what she (or he) is doing isn’t work, but care for your own children and you have been relegated to the unimportant. Venker also makes note of the fact that many moms work part-time (this is what the vast majority of my own circle of stay-at-home moms do, myself included), and that the distinction between a stay-at-home mom and a “working mom” is that stay-at-home moms plan their work around their children while working moms try to fit in parenting around their work schedule. There is also the economic impact of working. Having both spouses working can actually result in greater expenses than having one spouse stay home. Once day care, transportation, clothing allowances, and other work-related expenses are taken into account, it can often cost more to work. There is also an emotional toll on a marriage when both partners have stressful jobs. Once again, this is an issue that each family needs to make their best decisions about in light of their own particular circumstances. It is also a decision that many women don’t have the luxury of making if they are single mothers. Yet Bennetts is correct that stay-at-home moms do face economic consequences. Our retirement accounts don’t get contributed to and our social security benefits depend on our husbands. Wouldn’t it be better if the government actually supported the work mothers do by awarding mothers social security based on some agreed upon value, say $30,000 a year (I’m not saying that is all stay-at-home mothers are worth but it would be a start) or if there was a tax deduction for being a stay-at-home mom? There is a child-care credit? Why shouldn’t there be a credit for actually caring for your own children? I wish you all a very Happy and Holy Easter! "Yet ours were the sufferings he was bearing, ours the sorrows he was carrying, while we thought of him as someone being punished and struck with affliction by God; wheras he was being wounded for our rebellions, crushed because of our guilt; the punishment reconciling us fell on him, and we have been healed by his bruises. I attended the Holy Thursday mass this evening with my son David. I have always loved the Holy Thursday service - it is a celebration of the institution of the Eucharist - the core of our Catholic faith. I was invited by our Pastoral Minister a few weeks ago to be one of the twelve who has their feet washed in the re-enactment of that scene from the Last Supper in St. John's Gospel. I was honored and humbled by the invitation even if it did make me suddenly self-conscious about my feet! My original intention was to go alone to the service, but David wanted to come along and I certainly wasn't about to turn down a request to go to Church. He was actually very good despite the longer-than-usual mass. He has also become very inquisitive about the Eucharist. He is looking forward to making his First Communion and feels badly that he has to wait two more years. (I can relate - I remember being 4 years old and desperately wanting to be able to take part in communion). This evening, he was asking me, "Is it really Jesus?" and "How does he get into the bread?" and "If you eat his whole body, is Jesus all gone?" So, on the way home we had a conversation about the Eucharist. I tried to explain "Transubstantiation" (the big name for changing the bread and wine into the body and blood of Jesus) in a way that he could understand. I told him that the bread and wine still look and taste the same but that when the priest says the prayers of blessing and holds up the bread and the cup of wine, something in them changes to make it the body and blood of Christ so that Jesus can come into our hearts in a very special way. I also assured him that we wouldn't run out of Jesus. Jesus can be in all the Eucharist all over the world and never ever run out. I told him it was a miracle, that every time we go to Church we get to witness a miracle. He seemed to comprehend. It's all too easy to forget that a miracle is taking place right before our eyes at mass. We have seen it so many times, we take it for granted. But the Eucharist is a tremendous gift, and today is a day to remember the day the gift was first given. I am currently reading "Jesus: A Meditation on His Stories and His Relationships with Women" by Fr. Andrew Greeley, a well-known novelist and sociologist. In this book, he reflects on Jesus' parables and on his encounters with women, focusing on the element of surprise in all of them. In speaking about the parable of the Good Samaritan (Luke 10:25-37), Greeley writes of God's Mercy. This passage seemed particularly relevant in light of this being Holy Week, a time in which we remember the magnitude of God's mercy and forgiveness. In the final analysis we are all, sociologists or drug lords, ultimately powerless in the face of God. We are all truly helpless. We cannot bargain with God, we can negotiate with him, we cannot make claims on him, we cannot force his hand. We are as dependent on hismerciful love as the injured Jewish traveler was on the generous compassion of the Samaritan . . . Only when we are willing to put ourselves in a position of utter dependency on God will we understand the power, the surprise of his love. Jennifer Louden is a life coach who writes for Body and Soul Magazine. In her March 2007 column, a woman wrote in asking about deferring her dreams. She has dreamed of "opening a seaside B and B and getting a Ph.D. in art history" but she has put those dreams aside in order to pary the mortgage and care for her children. She was wondering if it is Ok to defer her dreams. Louden wisely told her that "the truly courageous course in life is one in which you choose to stick with your responsibilites, even when you sometimes feel the cost. Consider your present life as a mindful path, rather than a road of potential regrets." She also encouraged her to pursue her interests in a limited way by learning more about the things she was interested in. I think that all parents, especially mothers, can relate to this woman's yearnings. It can be tough to make choices and to sacrifice your own dreams for the sake of your children. But I like the idea of choosing your life. Make caring for your family a conscious choice. You definitely still need to have dreams. God may even lead you to find unique ways to fulfill them. But in choosing to bloom right where God has put you, you can feel a new enthusiasm for the life you lead. "Don't Cut Me Again! : True Stories About Vaginal Birth After Cesarean (VBAC)" is another book I was privileged to contribute to. These are all stories of women who wanted desperately to have a natural birth after a cesarean section. Today, cesarean sections have become more and more common, with some women opting for them simply for convenience sake. This book shows the other side of the coin - women who have had cesarean sections and don't want to go through that experience again. Many of the women had to fight for their choice to pursue a VBAC. Interestingly enough, I am the one woman in the book who didn't succeed in having a VBAC, even though I gave me my best shot. I think that my story provides a balance however. That sometimes even with a woman's best intentions, a cesarean is the best way to go to ensure a baby's well-being. One caveat - Do not read this book if you have not given birth to a child! If however, you are a woman considering whether or not to pursue a VBAC or a health care professional interested in what women have to say about the experience of cesarean and VBACs birth, this book provides a wonderful insight. A friend of mine was speaking about an upcoming career change in her life. She does not know where the road is leading her, but she knows that the time has come to move on from her current position. While she has some ideas of what she would like to do next, she is open to wherever God is leading her to serve. As she put it, "It's all about God!" God often invites us to travel down paths we had not considered. A common job interview question is "Where do you see yourself in five years?" I have always hated that question because my honest answer is "I have no idea." My five year plans have never worked out quite the way I expected. As a mother, I have often found that my one-day plans often don't work out the way I thought they would! Planning five years ahead is simply not possible. Even though life hasn't played out quite the way I thought it would when I was young, I have come to see God's plan for my life unfold itself. This is one of those things you can generally only appreciate in retrospect. You make a decision at one stage of your life that greatly impacts a later stage, even if at the time you had no idea it would take you in that direction. You casually meet a person who at a later date will play a major role in your life. A tragedy befalls us in which one can see no good and yet it later bears fruit in a totally unexpected way. We are always on a journey and that journey may have some detours and some slow-going in spots. Sometimes we may be going the wrong direction and need to make a u-turn. At other times, it may be smooth-sailing. Whatever the current travel conditions, if we trust in God and pray to do His will, we can believe that we are right where we are meant to be and that our journey is leading us to eternal life. My friend is right, though, that it is "all about God." Sometimes we get so wrapped up in ourselves. We have all of our plans and those plans may be good, but if they are not what God wants for us, we will not find the peace and happiness we seek. We make goals which focus on the things of this world - money, success, esteem in the eyes of our peers - instead of focusing on the things of the next world. We worry about our "self-fulfillment" instead of realizing that the only way to be truly fulfilled is by being full of God's love and sharing it with others. God is always calling us to listen closely to discover where He wants us to be and who He wants us to serve. Sometimes it can be hard to discern the correct path to take. There have been many times in my life I have wished for some direct communication - letter, phone call, email, burning bush (I'm really not picky!) but all I have heard is silence. God works in His own time and His own way. Eventually, with enough prayer, the answers reveal themselves. God speaks through other people and circumstances as well as in the quiet of our hearts. He leads us and then an opportunity presents itself. Mother Teresa once said, "God doesn't call us to be successful, He calls us to be faithful." If we do what we truly believe God is calling us to do, then that is all we can do. Even if the results here and now seem minimal, we are playing our part in God's plan. After all, it's not about us at all. It is all about God.